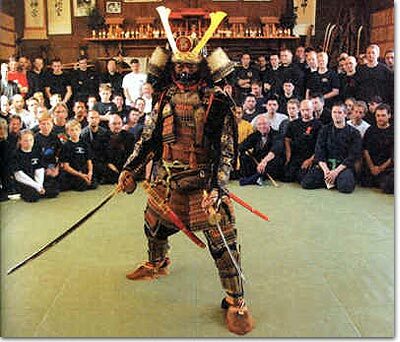 Bujinkan Budo Taijutsu, is comprised of nine traditional "ryuha" or schools, which we use to form our curriculum in the Bujinkan. The training is generally referred to as taijutsu (body arts), and is composed of both armed and unarmed methods of fighting. Much of the basic taijutsu taught to beginners comes from six primary lineages in the Bujinkan compendium, namely Koto¯-ryu¯, Gyokko-ryu¯, Shinden Fudo¯-ryu¯, Takagi Yo¯shin-ryu¯, Kuki Shinden-ryu¯, and Togakure-ryu¯. Soke Masaaki Hatsumi focuses the training of the Bujinkan on the "feeling" of technique, or perhaps more accurately, what he terms the feeling of real situations (shinken). While technical knowledge of an art is considered important, the direction of this feeling-based approach guides the practitioner towards a "natural understanding" of what links various martial lineages as well as what is most effective in real situations. We are a Dojo, not a gym or studio. A gym makes money from those that do not actually attend, have interest in losing weight, or that desire to build large muscles. Studios focus on the competitive or even the business aspects of the sport type martial arts. Here in our Dojo, we focus on traditional training for real life situations. This is still done in a family type atmosphere. Teachers and students also exchange bows, not as a sign of servitude, but as a mutual sign of respect. This system of martial arts is older than the popular Judo, Karate, or Taekwon-Do arts, and retains its warrior heritage intact. Our 900 year-old tradition is ideal for actual personal defense since it requires no speed or strength, but relies on instinctive and natural movements. We build upon timing, distance and balance. In fact, this system is sometimes referred to as the “Martial Arts of Distance”. Our practices include "Taihenjutsu", or methods of rolling, falling, footwork, and body positioning skills, "Dakentaijutsu", striking methods with the hands, feet and other parts of the body, as well as "Jutaijutsu", or grappling skills that include, joint manipulation, throwing, and takedown skills. Our skills are taught as two man drills, that we call kata. Each kata, is explored as a method of teaching a principle, that can be expanded upon in a variety of situations, and applications. Students can adopt, and adapt new ideas and techniques that will suit their particular body structure and psychological make up. From our unarmed skills, students progress to encompass many traditional weapon skills. Our curriculum is large and contains many aspects that will offer a student unprecedented opportunities to develop his/her skills. As with all of our programs, training takes place in a safe and non-competitive atmosphere.